One Person’s Ramblings on Kathmandu and Bhutan. June 1st came and I got panicky. Two more weeks and I will be off to Bhutan. With much anxiety and trepidation, I wondered again why I signed up for that Photosafari trip with those guys. Maybe some inherent masochistic condition within me. Maybe I was just naïve. To think that it would be an easy peasy rambling walk that guy, Yusuf told me its going to be. The walk to The Tiger’s Nest, that is. Everybody should go see the Tiger’s Nest once in their lifetime, so they tell me. The optimistic me says Yay, the realistic me went 0_0. My tiny bag for 10 days was packed to the brim with recommended breathable Tshirts that were bought for the Gym (however these never got to see the Gym’s incandescent lights), and in my backpack, my brandnew mirrorless Sony A7 and two lenses bought a week before – just because it is much lighter than the Nikon. Maybe the two lenses were not enough, but I wasn’t as kiasu as the other half, and was also money pinching. However, trust me, it is much much lighter…. But alas it also has a price to pay, but more on that later. Air Asia X, how I love thee. But, why or why KLIA 2? It took me a good 25 minutes from check in to the Gate, and that was a quickish walk. And, errr, food at KLIA 2 is unmistakably poor, and you should just go eat somewhere else. Before the much anticipated visit to Bhutan, we flew to Kathmandu which at 1,400M gave us an easy acclimatization for the higher mountain ridges. I last visited Kathmandu some 11 years ago, and somehow did not think it changed much. But then again, 11 years ago, I did not throng the streets like I did now. People are still friendly, things are still relatively affordable. We also had a youngish but informative guide by the name of GMan who was oh so accommodating and patient. Highly recommended. Waking up early in Kathmandu gave us insights into their rich daily lives, their prayers and simply such different perspectives of everyday chores. Their markets and squares are crowded, but clean and orderly. There was no shoving nor pushing and everyone returns a smile. Prayers are a big thing and it carries on from the simple morning rituals to more complex ceremonies guided by monks or people in the know. After a few days and some shopping later (The cashmere scarves are really to die for. Tip : Forget about the cheap ones, buy the best you can afford. You won’t regret it.) We took DrukAir (I perceived it to mean Drug-Air, but actually it means Dragon Air, which somehow is not as intriguing) from Kathmandu to Bhutan. The only international Airport in Bhutan is at Paro, and we are told it was because of the popularity of the Tiger’s nest. This airport serves Thimphu, its capital, its largest city. I was also told that the Paro airport is one of the world’s most challenging. There are also no night flights and all depends on the weather. I was also advised to ask for the left-side seats so that I could take in the magnificent views of the peaks. But no one told the check-in guy which was the left side, so he put us on the left side as we entered which eventually meant the wrong side. Haish. The pilot(s) however are first class, and landing in that narrow strip was so smooth it puts a lot of the major airlines’ pilots to shame. This was also true on the return trip, so, kudos to the Drukair pilots. The new Indian Prime Minister Modi also chose Bhutan as his first international visit abroad on the same day as we landed in Paro, so we had the whole military band waiting for us. Security however was quite relaxed. No schizophrenic screenings nor body searches. It was also seen later on in our visit the marked influence India has over its neighbouring country’s infrastructure and military. Unfortunately, I really cannot recall much on what I have eaten in Bhutan. Maybe because we were given tourist food, like what they expect us to be comfortable with. One night, we ventured out to an Indian restaurant to have some briyani and some delicious butter and garlic naans but the meat was unimaginably tough. I learnt later that they wait for the animal to die before it can be put on the table, thus the meat is of a really really old animal. Or when it falls off the mountainside. That’s why they eat more vegetables than meat. Healthy. Not tasty. Our guides were all named Sonam. So we had Sonam I for a few days and then we exchanged with the other bus and got Sonam II. Both were pretty good, but Sonam II was more patient. I wonder why that becomes important to me. The highlight of our Bhutan visit, came soon enough, and we started to trek upwards. Proud to say, we did not cheat, not like those people who took the horses or mules. and with lots of huffing and puffing which I blamed it on the altitude, and constant excuse-stops to take lousy snapshots of the breathtaking views, I made it to the 3,100M height overlooking the Tiger’s Nest in just under 3 hours. About double the time that Joanna and that Mr Chan took. I spent the next hour or so resting looking at the prayer flags flapping. It was both serene and tranquil. An interesting green weed also thrives in the highlands. It grows lush and wild, and is much sought after by many, disapproved by some, and which tastes minty. Would make a good ulam with a piquant sambal belacan. We made our way from Paro to Thimpu after a couple of days of shooting zhongs or monasteries, till I am confused which is which after a few days. The names aren’t the easiest to remember. There were monks and more monks. But they were pretty cool people and didn’t mind us too much sniper shooting them. Some of them were downright accommodating. Come to think of it, I saw only youngish monks. Where were the older, scholarly monks I wonder. Meditating? Hiding away from our prying cameras? Besides what we would imagine how monks would look and live, there were some surprises too. There are also guards around. To guard the monks or the visitors? The Bodhi Tree is a total personification of calmness and tranquility. Imagine having one in your garden. Zen. There was one that reaches out and shelters all from the bad and evil and you’ll feel a quietness within you just by sitting under it. These people shown here of course were just hiding from the sun and didn’t have time to feel the zen. On the way to Punakha, we stopped by the Dorchula Pass resting area where there was this place with 108 stupas. It was surreal and magical. It was like how imagining living in the sky would be. However on the way back, it rained, and the atmosphere was changed. Bhutan also has a Gross National Happiness Index. The essence of which is the peace and happiness of the people. Males are happier and so are unmarried people and the unemployed. I wonder how Malaysians will fare with this survey. 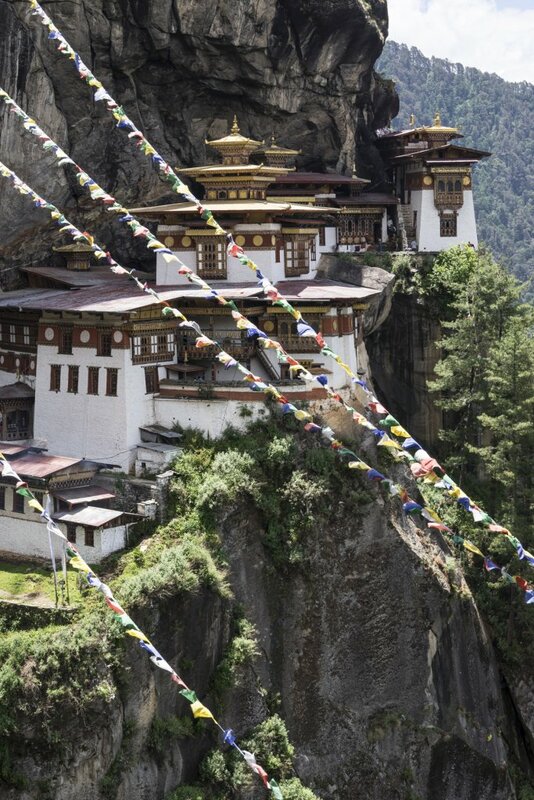 There is so, so, much more to Bhutan. I think we covered only a trickle of it in those few days. And from that trickle, I can only cite but a few beautiful memories. Will I be back? I doubt it. But at least I have been there once. Have you? Oh yah, that Sony A7… well, it made me feel inferior when taking photos beside those with the machine-gun cameras that went derderderderder. Mine went, focus, click, waiiiiit….. focus, click, waiiiiiit…. Would a kind Sony person be willing to teach me more without me having to read the instruction book? And Thanks to the other half for being my support on my way down the slopes, for shielding me for private times because I didn’t bring an umbrella and thanks to the others for the Panadol, fun and memorable times.